Fitness is a set of images by Barbara Anne Williams to inspire the journey to get into shape. Tape measures and apples are joined by trainers (tennis shoes, sneakers), weights, a water bottle and even a scale. Several word art images complete the set along with a coordinating polka-dot background paper and checkered divider bar. 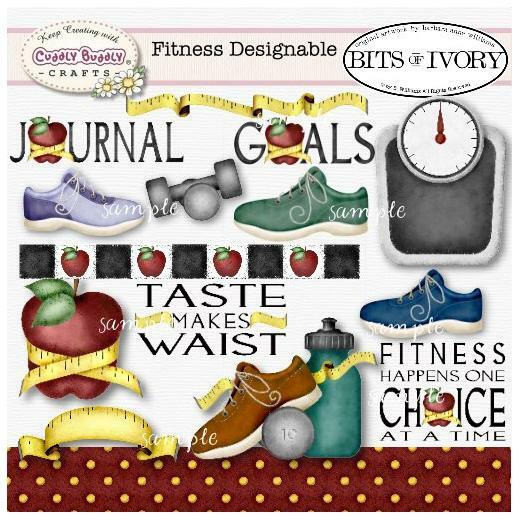 Whether you're documenting a fitness accomplishment in a scrapbook, or creating a card to encourage someone's steps to better health, this motivational set is just the thing. The paper is 8x8 inches and all images are 300 dpi png and jpg images for excellent print quality.